- Publisher Why do we often miss our goals or fail to realize our dreams? Author, broadcaster and consultant Mary Whelchel says the trouble is that we don't have the discipline it takes to pursue our desires. As a result we may fail to use our God-given talents and live half-fulfilled lives. In a lighthearted but direct manner, The Snooze-Alarm Syndrome teaches readers how to apply biblical principles and practical methods to help us make things happen at work and at home. This handbook on basic disciplines stands out among numerous secular guides because of its Christian, Scripture-based perspective. 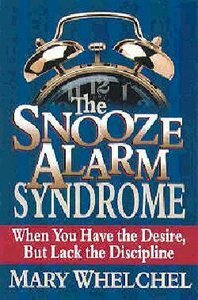 About "The Snooze Alarm Syndrome"
Why do we often miss our goals or fail to realize our dreams? Author, broadcaster and consultant Mary Whelchel says the trouble is that we don't have the discipline it takes to pursue our desires. As a result we may fail to use our God-given talents and live half-fulfilled lives. In a lighthearted but direct manner, The Snooze-Alarm Syndrome teaches readers how to apply biblical principles and practical methods to help us make things happen at work and at home. This handbook on basic disciplines stands out among numerous secular guides because of its Christian, Scripture-based perspective. Whelchel is the foudner of The Christian Working Woman and the director of Women's Ministries for Moody Memorial Church in Chicago, Illinois.